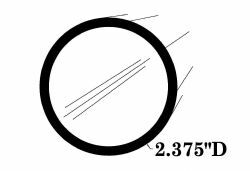 2.375" ODx .154" wall (2.067" ID) is stocked in 6005A-T61 alloy and a Class I Etched and Clear Anodized finish. Available in 24 ft., 12 ft., 8 ft., 6 ft. and 4 ft. lengths. Click on above Document link to display all round pipe and tubes in a Table View.